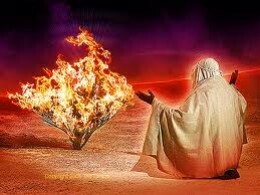 Moses at the burning bush, when the great I AM called him. Exodus 3:13,14 And Moses said to God, Behold, when I come to the children of Israel, and shall say to them, The God of your fathers has sent me to you; and they shall say to me, What is His name? what shall I say to them? 14 And God said to Moses, I AM THAT I AM: and He said, Thus shall you say to the children of Israel, I AM has sent me to you. And God <0430> said to Moses, I AM <01961> THAT I AM <01961>: and He said, Thus shall you say to the children of Israel, I AM has sent me to you. Strong’s word for God <0430> is elohiym (pronounced el-o-heem). Then, 2000 years ago, God the Lord and Creator came to dwell in human flesh. He was born of a virgin. Scripture tells us “the Word was made flesh”. He was begotten of God. John 3:16,18 For God so loved the world, that He gave His only begotten Son, that whosoever believes in Him should not perish, but have everlasting life. 18 He that believes on Him is not condemned: but he that believes not is condemned already, because he has not believed in the name of the only begotten Son of God. The same Creator of the Universe, the same God who spoke with Moses, took on mortal flesh and His Name is recorded in the New Testament in the following scriptures translated from the Greek text (KJ3 = Literal Translation Bible). John 4:26 Jesus said to her, I AM! the One speaking to you. John 6:20 But He said to them, I AM! Do not fear. John 8:24 Therefore, I said to you that you will die in your sins. For if you do not believe that I AM, you will die in your sins. John 8:28 Therefore Jesus said to them, When you lift up the Son of Man, then you will know that I AM; and from Myself I do nothing; but as My Father taught Me, these things I speak. John 8:58 Jesus said to them, Truly, truly, I say to you, Before Abraham came to be, I AM! John 13:13 You call Me the Teacher, and, the Lord. And you say well, for I AM. John 13:19 From now I tell you before it happens, that when it happens you may believe that I AM. Matthew 14:27 But immediately Jesus spoke to them, saying, Have courage, I AM! Do not fear. Mark 6:50 For all saw Him, and were troubled. And immediately He spoke to them and said to them, Have courage. I AM! Do not fear. Mark 13:6 For many will come in My name, saying, I AM! And they will lead many astray. Mark 14:62 And Jesus said, I AM! And you will see the Son of Man sitting at the right hand of power, and coming with the clouds of the heaven. Luke 22:70 And they all said, Are You, then, the Son of God? And He said to them, You say it, because I AM! He was there before Abraham. He is I AM, the self-existent One. His name is Jesus, born in a manger, fully human yet fully God, the Son of God, the Savior of the world. John 3:16,17 For God so loved the world, that He gave His only begotten Son, that whosoever believes in Him should not perish, but have everlasting life. 17 For God sent not his Son into the world to condemn the world; but that the world through Him might be saved. This entry was posted in Belief in God and tagged children of Israel, elohiym, I AM, I AM THAT I AM, Israel, Jehovah, Jesus Christ, John Hartnett, Lord Jesus Christ, Moses, only begotten Son, Self-existent one. Bookmark the permalink.